In the world of fine gems, most gems are one-of-a-kind. If you've ever searched for a gem to match one that you already own -- say, for a pendant or earrings -- you know just how difficult a search it can be. The search for a matching stone usually ends, sad to say, in frustration. The most opportune time to match up gems is when the rough stone is cut. Sometimes a parcel of similar material will yield a matching pair without much sacrifice of weight. Very occasionally a more elaborate suite is possible, with matching stones for ring, pendant and earrings. During the cutting process we are always looking for opportunities to create matching sets. When you buy a fine gemstone from AJS Gems, you buy our eye as well as our gem. Certain gem varieties are easier to match up than others, mainly due to color consistency in the rough material. You'll find we have a very good selection of matched pairs in Aquamarine, Morganite and Imperial Topaz. It is much harder to find matched pairs in Tourmaline because of the enormous color variation. 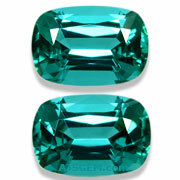 But we've recently added some outstanding pairs of the rare Blue Tourmaline from Namibia. Other unusual matched pairs in our collection include Spessartite Garnet and Royal Purple Garnet. We currently have an excellent selection of high quality sets in these rare gems. 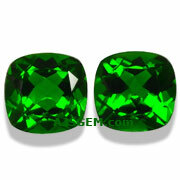 We have also recently added some some fine matched pairs of Chrome Diopside at very affordable prices. This month we feature some of the best values from our Closeout collection. Click on any photo to view the details for the gem. 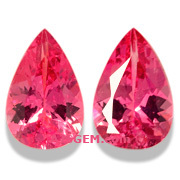 A rare matched pair of Mahenege Spinels in a vivid pink. You will rarely see a matched pair of these unusual Spinels, characterized by their unique neon glow. These will make a stunning pair of earrings for someone special. Guaranteed natural and untreated. 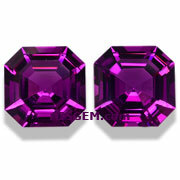 A gorgeous matched pair of Royal Purple Garnets from Mozambique, exquisitely fashioned in a precision Asscher cut! This is beautiful clean material with a vivid open color. Under cool light, these gems display a rich purple hue, changing to cranberry with magenta flashes under incandescent light. These rare gems will make an exceptional pair of earrings. Guaranteed natural and untreated. 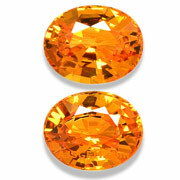 An outstanding matched pair of Spessartite Garnets, over 4 carats total weight! Very clean material in the top mandarin orange, and perfectly matched. These fine gems will make a beautiful pair of earrings. Guaranteed natural and untreated. An unusual and unique matched pair of fine beryls -- 2 aquamarines and 2 pink morganites. These elegant pears are beautifully matched and completely clean, and will make a gorgeous set of drop earrings. 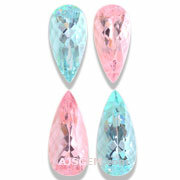 One pair of matching aquamarine/morganite is 7.55 cts (16.38 x 7.64 x 5.87 mm) while the other matching pair is 6.45 cts (14.98 x 7.25 x 6.08 mm). Truly a one-of-a-kind set for the colored gemstone collector. Guaranteed natural and untreated. A fine matched pair of Chrome Diopsides in a saturated chrome green. Though Chrome Diopside is a softer gem -- 5 to 6 on the Mohs scale -- they are perfect for earrings. This 7 mm pair of square cushions has the rich color of Tsavorite Garnet, but at a fraction of the price. Guaranteed natural and untreated. A rare matched pair of Pink Imperial Topaz from Brazil! Perfectly sized for earrings, these elegant pears have wonderful fire. 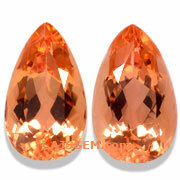 Pink is a rare and unusual color in Imperial Topaz and these are very clean and completely untreated. Guaranteed natural by AJS Gems, Bangkok. 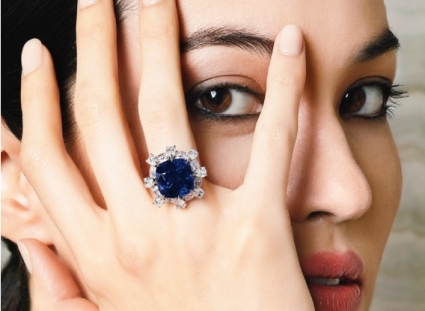 Sotheby's will offer a rare large Kashmir Sapphire and Diamond ring at their upcoming Magnificient Jewels and Jadeite sale in Hong Kong. The 13.88 ct unheated Royal Blue Sapphire, certified by SSEF and Gubelin, is surrounded by pear-shaped diamonds embellished with marquise-shaped diamond spacers, mounted in 18k white gold. The pre-sale estimate is USD $1.783 million to $2.293 million. 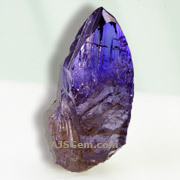 Tanzanite is the mineral zoisite, which typically forms as brownish violet colored crystals. When heated at low temperatures (less than 600 degrees Celsius), many of these crystals will turn a rich violet-blue. This heating process can sometimes take place naturally in the ground, but is most often done in an oven after the crystals are mined. You'll find that Blue Tanzanite is almost always labelled as "heated" when sold by reputable dealers, though gemological labs are currently unable to detect this low temperature heating and their Tanzanite reports may note that treatment is "undetermined." 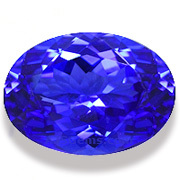 Having said that, there are some rare fancy colors in Tanzanite which occur naturally without heating. The colors include green, golden, orange, green-blue, pink and purple. The pink Tanzanite in particular is a very rare collector's gem.